Seasonal times Festival and Christmas: 3am licence (weekends). Food served Mon–Sun 8am–11.30am, noon–10.30pm. A colourful West End bar with an American diner-inspired menu. Perched on a crossroads in Edinburgh’s West End, The Huxley’s large windows and relaxed seating allow for fantastic people-watching opportunities. Within the restaurant, the menu and décor are an equally eclectic mix; tweeds, orange leather benches and a mismatch of (now threadbare) chairs set the scene for diverse food. But while this magpie approach has served the interiors well, the menu feels as though it's having something of an identity crisis. With a definite nod to Americana, it's filled with burgers, hot dogs and dirty fries, with a handful of lighter options like salad bowls for the more health-conscious patron. 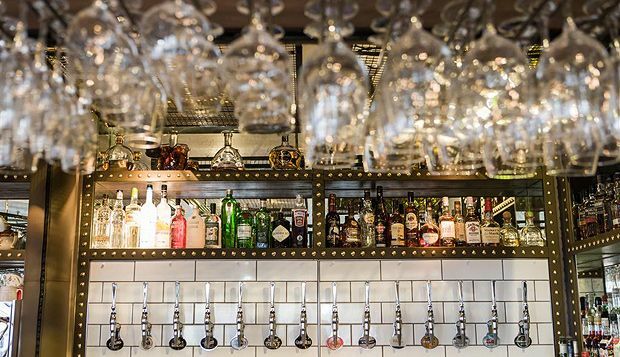 Highlights include a juicy rib and bone burger and exceptionally moreish skin-on fries, but the tap list is predictable and some of the no-frills pub food does struggle to live up to its stylish setting. Live entertainment: Live music on Friday evenings.